Help Show Off Our Lab to the World! On July 17 and 18 well over a hundred electron microscopy enthusiasts converged on Berkeley Lab for the second NTEAM Workshop, eager to help design a revolutionary new National Transmission Electron Achromatic Microscope. "I was really surprised at the response," said Uli Dahmen, a workshop organizer. Three times as many people attended as the first workshop two years ago, and there was "an extraordinarily high level of participation and very high level talks." Introduced by Uli Dahmen, Berkeley Lab Deputy Director Pier Oddone welcomed attendees to the NTEAM Workshop, noting that while electron microscopy "is quite a specialized topic," better facilities "will have a broad range of applications, a role well understood by DOE." Speaker after speaker described microscopes of the future that will eliminate spherical and chromatic aberrations and other distortions that have plagued the field since its beginnings. Prospects include direct imaging at half-angstrom resolution (less than the radius of a hydrogen atom), studying single col-umns of atoms in a material, 3-D modeling of the way atoms are arranged in defects, and even providing room to do experiments inside the microscope. 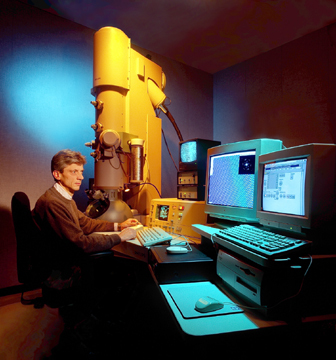 Four Department of Energy centers sponsored NTEAM, the Electron Microscopy Center at Argonne National Laboratory, the Center for Microanalysis of Materials at the University of Illinois, the Shared Research Equipment User Facility at Oak Ridge National Laboratory, and Berkeley Lab's National Center for Electron Micro-scopy, headed by Dahmen. NTEAM is timely, says Dahmen, because, coupled with urgent new scientific and industrial demands, "aberration correction has only become feasible recently. It represents a revolution in electron micro-scopy." To launch the workshop a series of invited speakers addressed the growing need for atomic-scale analysis. Among them: Mildred Dresselhaus, MIT physics professor and former head of DOE's Office of Science, who spoke of the dearth of data on electronic states in the nanoworld, "where quantum mechanics rules;" Lumileds Lighting's George Craford, who discussed the mysterious behavior of LED materials on the atomic scale, which poses major problems in efficiency and manufacturing; and David Eaglesham of Bell Labs, who described a semiconductor industry whose quest for cheaper, faster chips will soon hit a wall unless there is a revolution in materials and methods - one in which high resolution microscopy will play an essential role. With its bright, steerable beams of charged particles that interact strongly with materials, transmission electron microscopy has long complemented neutron and x-ray sources. But since the beginning, aberrations have kept electron microscopes from achieving their potential. Spherical aberrations occur because rays passing through the edge of a lens bend differently than those passing through its middle. Chromatic aberrations result when rays of different wavelength (energy) focus at different distances - a problem made worse by long focal length lenses. Existing electron microscopes have short focal lengths, with little space between the objective and the sample. Uli Dahmen with NCEM's One Angstrom Microscope, one of the world's most powerful. Proposed NTEAM microscopes would directly produce images with 80 percent better resolution. Aberrations of visible light are corrected in the construction of lenses and mirrors. The lenses of electron microscopes, however, are electric and magnetic fields; while the principles for correcting their aberrations were laid out half a century ago, the fixes were technically impossible. Many different elements work together to steer electrons through a microscope column, and changing one parameter means adjusting dozens of others. Recently, however, computers have become capable of coordinating multiple corrections. A few microscopes have already improved image resolution by correcting for spherical aberrations, but they must still use extremely short focal lengths. "Straightforward resolution is a function of wavelength and spherical aberration, and we are already seeing improvement in this area," Dahmen says. "But to increase the information limit of a microscope" - the visual information available even when image components are not all perfectly in phase - "we need to reduce chromatic aberration." Improved power sources and monochromators make it possible to design new microscopes whose beams have very little energy spread. Correcting chromatic aberration will allow long focal length lenses, opening space in the microscope where the specimen is placed - enough space to allow in-place manipulations for biological and materials science experiments. Increasing focal length provides room for experiments but makes high resolution more difficult. Many other variables, such as the advantages of different voltages, mean a single NTEAM instrument can't meet everyone's needs. Robert Sinclair of Stanford, one of the working group leaders, put it succinctly: "One machine is not enough for the people in our group, much less for the world." Because of "the philosophy of the NTEAM project," Dahmen hopes the Office of Basic Energy Sciences in DOE's Office of Science will be receptive to a proposal for four or five distinct instruments. He notes that the cost involved for electron microscopes is a few million dollars, compared to hundred of millions for synchrotrons. More important, he says, "the four microcharacterization centers are the only group in DOE who collaborate like this, serving the needs of a broad community by coordinating the differing strengths and expertise of four different centers."
?" 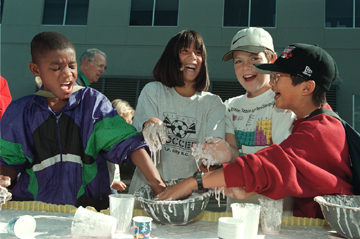 community educational campaign, the 2002 Laboratory Open House on October 5 will echo that theme in its presentation of the many scientific wonders found here. Every division and department at the Lab will play a part in the fourth modern installment of this biannual tradition. The all-day program will include hands-on activities and scientific exhibits, facility and site tours, lectures and demonstrations, a children's science zone, a career fair, plus food and music. Some of the Lab's most distinguished scientists will share the highlights of their research for the estimated 5,000 visitors who are expected to descend upon Berkeley Lab between 10 a.m. and 4 p.m.
?" poster campaign will be on hand to interact with visitors at the "Ask A Scientist" table. Among the highlights will be a "robotics corral" being developed by the Engineering Division to demonstrate the versatility and utility of these mechanical assistants. Engineering will also sponsor the ever-popular "electronic petting zoo," in which youngsters get to dismantle and inspect used computers and other high-tech devices. The Advanced Light Source will be the center of much activity, including tours of the experimental floor and science talks. Several of the beamlines will host demonstrations. The Life Sciences offerings, most of them at Building 84, will feature minidemonstrations, a "junior gene sleuths" interactive experience for children, and a microarray robotics exercise. Environmental Energy Technologies will showcase an array of displays about energy efficient lighting, building design, electricity use, and "smart windows" technology. The Physics Division will feature lectures, a remote telescope viewing activity, the SNAP satellite project, displays about BaBar and other particle detectors, and a web-based "particle adventure" for kids. Other program highlights will be announced in the coming weeks and will be noted online at www.lbl.gov/OpenHouse. Another traditional favorite, the family science zone, will stage child-oriented math and science activities grouped by age. These hands-on experiences will teach children about concepts like magnetism, light defraction, motion and bubble chemistry. Under four tents in the Building 50 parking lot, the zone will also feature glass blower Tom Orr and some special demonstrations by Chabot Space and Science Center. In the auditorium, a day-long series of lectures by distinguished scientists will offer informative 30-minute respites from the outdoor shows. An exhibition by the Lawrence Hall of Science will also be included. Special events include an award ceremony for outstanding teachers, which will follow morning teacher workshops sponsored by the Center for Science and Engineering Education; and the dedication of the Seaborg Conference Room in Building 70A. The designation will honor one of the Laboratory's most decorated researchers, the late Nobelist Glenn T. Seaborg. The room (3377) will feature memorabilia from Seaborg's career. The Berkeley Lab Music Club will coordinate a day of performances on the stage at the cafeteria, ranging from classical to Latin to rock 'n' roll. Food booths in the lower cafeteria parking lot will offer a diverse assortment of low-cost fare. As with previous Open Houses, onsite parking will be limited. Most visitors will arrive on buses from campus parking lots and the BART station. The Open House Task Force, which is coordinating the planning for the event, includes Ron Kolb, chair; Molly Field, logistics manager; Sonia Mueller, administration; Marilee Bailey, Jane Baynes, Don Bell, Bob Berninzoni, Jim Breckinridge, Tammy Brown, Pat Butler, Laura Chen, Lori Fong, Todd Hansen, Tony Hansen, Alyce Herrera, Tristan Hidalgo, Don Hubbard, Ginny Lackner, Shannon Magee, David Malone, Sheril Miura, Rollie Otto, Pam Patterson, Terry Powell, Valerie Quigley, Art Robinson, Anna Smith, and Jane Tanamachi. Representatives from the Divisions include Ellen Ford (Physical Biosciences), Mary DiFranco (Life Sciences), Marcelo Lippmann and Susan Hubbard (Earth Sciences), Allan Chen (Environmental Energy Technologies), Joe Chew (Accelerator and Fusion Research), Tony Spadifora, Jeanne Miller and Eric Linder (Physics), Peggy Norris (Nuclear Sciences), Liz Moxon (ALS), Corwin Booth (Chemical Sciences), Joel Ager (Materials Sciences), Ken Chow (Engineering), Shelley Worsham (Environment, Health and Safety), and Charlie Osolin (Genomics). Those who wish to volunteer as workers and hosts at the 2002 Open House should contact their divisional representative above or volunteer coordinator Todd Hansen at X6105. Sonia Mueller will answer general questions at X5944. what it would be like to volunteer at Berkeley Lab's Open House? Then find out. On Saturday, Oct. 5, thousands of neighbors, Lab families and friends will visit our Laboratory to find out what we do, how and why we do it, and who we are. You can help us create a welcoming environment by being a volunteer tour guide, docent, or information assistant. Dozens of helpers are needed too show off our Lab and its programs. It's fun, and you get a free T-shirt, too. To volunteer, call Todd Hansen at X6105, or e-mail him at [email protected]. The journal Physical Review Letters last week finally published a retraction of the 1999 paper from Berkeley Lab which had announced the discovery of a new chemical element, 118. The Laboratory publicly retracted that result last summer, but the originating journal held up the official notice due to a protest by the paper's lead author. News reports noted this in national coverage last week, and reported what Laboratory Director Charles Shank had told employees in an address on June 25: that the results of the research had been fabricated and that scientific misconduct had been committed. Although the Laboratory would not identify the individual involved, the details of the fraudulent activity, or the nature of the corrective action taken due to an ongoing grievance, it did acknowledge the accuracy of news reports that said former senior scientist Victor Ninov was dismissed from his position in May. In at least two news reports, Ninov was quoted confirming his dismissal and maintaining his innocence. Lab officials said that a preliminary investigation last October and November and a subsequent formal investigation from November through March were conducted, as provided in the Lab's Integrity in Research policy. Both reviews determined that data was fabricated in studies that led to the announced discovery of element 118 and its decay product, 116. "Integrity of the research enterprise is crucial to the search for new knowledge," Director Charles Shank said. "All individuals involved in scientific research at Berkeley Lab have an obligation to create an environment that encourages absolute intellectual honesty. Exceptions will not be tolerated." Shank said he will reemphasize the importance of integrity in research, which includes an emphasis on quality, peer review, and accurate and detailed research procedures, to the entire Laboratory community. "There are many lessons here, and the Lab will extract all the value it can from this experience," he added. In his address to employees in June, Shank said, "I am proud of the intensity and professionalism of the [internal] review to get to the bottom of this, and of the commitment of the Laboratory to the highest level of scientific integrity. There is nothing more important for a laboratory than scientific integrity. Only with such integrity will the public, which funds our work, have confidence in us." Secretary of Energy Spencer Abraham has announced five major research awards for a total of $103 million over the next five years as part of its new "Genomes to Life" initiative. Included in this package were $26.1 million awarded to Berkeley Lab researchers in the new Virtual Institute for Microbial Stress and Survival (VIMSS). Said Secretary Abraham in announcing the awards on July 23, "This innovative research program offers biotechnology solutions that can help us produce clean energy, clean up the environment and make a significant contribution to the President's policy on climate change." 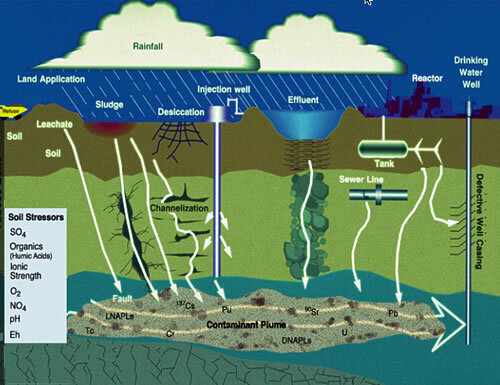 The money to VIMSS is part of a $36.6 million grant for fundamental research on applied environmental microbiology, functional genomics, and computational models that describe and predict the stress responses of microbes to environmental conditions in metal and radionuclide contaminated waste sites. VIMSS will also manage portions of this grant awarded to three collaborators: the University of Missouri at Columbia ($3 million); the University of Washington ($2.8 million); and the Diversa Corporation ($3.2 million). The remaining funds will go to VIMSS collaborators at Oak Ridge National Laboratory and Sandia National Laboratory. In Washington, D.C. to accept a ceremonial check on behalf of Berkeley Lab was Adam Arkin of the Physical Biosciences Division who codirects VIMSS with Terry Hazen of the Earth Sciences Division. "Our role will be to characterize the response to environmental stress by bacteria," Arkin told Office of Science Director Ray Orbach at DOE's on-site review last month. "The idea is that if bacteria will transform metal and radionuclide contaminants in waste we won't have to treat it." Added Terry Hazen, "Given the mind-boggling advancements that have been made in genomics and biotechnology, heralded by the Human Genome Project, it is now time for us to turn that same research drive on DOE's worst and most expensive problem: nuclear waste contaminated environments." DOE's current plan for cleaning up the environment at 350 sites would take 70 years to complete at a cost of $300 billion. The Genomes to Life program aims to do the job better while saving billions of dollars. DOE's "Genomes to Life" program calls for researchers to take advantage of "solutions that nature has already devised" to help solve problems in energy production, environmental cleanup and carbon cycling. The goal is to make advances in systems biology, computation and technology that will "contribute to increased sources of biological-based energy; help understand the earth's carbon cycle and design ways to enhance carbon capture; and lead to cost-effective ways to clean up the environment." More information on the Genomes to Life program is available at http://DOEGenomesToLife.org. On July 22 Ashok Gadgil of the Environmental Energy Technologies Division was honored by the World Technology Network (WTN) with the World Technology Award for Energy. The WTN awards recognize innovative individuals and companies worldwide who most contribute to the advance of emerging technologies for the benefit of business and society. Gadgil's award was bestoweed for his invention of UVWaterworks, an energy efficient device that can quickly and effectively disinfect contaminated water. Robert O. Ritchie, head of Structural Materials in the Materials Sciences Division, has been elected to the Royal Academy of Engineering in the United Kingdom. Ritchie was cited for his expertise in fatigue and fracture of engineering materials. The Academy honors the UK's most distinguished engineers, electing up to 60 Fellows each year. It is the equivalent of the U.S. Academy of Engineering, to which Ritchie was elected in 2001. DOE's Office of Science (SC) has announced a major restructuring of its headquarters and field organization. This project is aimed at reducing layers of management, streamlining decision-making processes, clarifying lines of authority, making more efficient use of resources, and reshaping and rebuilding the SC work force. "The Office of Science is fortunate to have many highly qualified, dedicated employees who have helped make the science programs we support world leaders in the development of new knowledge and cutting edge science," said SC director Ray Orbach in announcing the reorganization on July 23, while visiting Argonne National Laboratory. "But DOE research programs face many challenges, including continued pressure on scarce resources. For the Office of Science to continue to deliver top quality science to the nation, we must become 'best in class' in our management operations as well." The SC restructuring project will take place in three phases over a two-year period that begins with a project rollout scheduled for December 31, 2002. The project will be carried be out by a team of headquarters and field employees under the leadership of Edward Cumesty, deputy manager of the Oak Ridge Operations Office. Details about the restructuring plan can be viewed on-line at http://www.screstruct.doe.gov. When the genome of the Japanese pufferfish Fugu rubripes was sequenced last year by an international consortium led by the Joint Genome Institute (JGI), the promised payoff was a substantial short-cut to finding genes embedded in the human genome. That promise is now being realized with the announcement from JGI that through comparative analysis between the pufferfish and human genomes, researchers have been able to predict the existence of nearly 1,000 previously unidentified human genes. "Comparative genomics programs like the Fugu project are key to understanding the biology of the human genome," said Berkeley Lab geneticist Eddy Rubin in the JGI announcement. Rubin, who heads the Genome Sciences Department in Berkeley Lab's Life Sciences Division, is now serving as JGI's interim director. "As historic and important as the Human Genome Project is, it's only the first step in determining how genes work - and why they sometimes don't work the way they should." Because evolution has conserved many of the DNA sequences that code for proteins or regulate gene expression, comparing genome sequences between species is an effective tool for gene hunters. Decoding the pufferfish genome was considered a prize because it contains essentially the same genes and regulatory sequences as the human genome but within approximately 365 million bases as compared to the 3 billion bases that make up human DNA. With far less so-called "junk DNA" to sort through (the non-coding sequences that make up about 97 percent of human DNA), finding genes and regulatory sequences in the pufferfish genome was expected to be a much easier task than searching the human genome. It is estimated that nearly three-fourths of the genes in the human genome have identifiable counterparts in the pufferfish. "These similarities are recognizable in the two genome sequences despite the 400 million years of evolution since the two species diverged from their common ancestor," explains Dan Rokhsar, a physicist with Berkeley Lab's Physical Biosciences Division who serves as JGI's associate director for Computational Genomics. The nucleotide sequences of JGI's predicted genes can now be used to help identify the function of the encoded proteins in the human body. This can be done, for example, by comparing the sequence of a predicted gene to known sequences from a protein database. JGI is one of the largest publicly funded genome sequencing centers in the world and is jointly operated by Berkeley Lab, Lawrence Livermore and Los Alamos national laboratories. Closing a long and sometimes difficult chapter in Berkeley Lab relations with the community, the U.S. Environmental Protection Agency last week announced that the Laboratory will not be placed on the eligibility list for Superfund Priority clean-up status. The decision basically gives the Lab and its environmental management program a clean bill of health, something that a few members of the Berkeley community had contested for years. "It is both a relief and a welcome validation of what we have been saying all along," said David McGraw, division director for Environment, Health and Safety. "Let's hope this brings the rhetoric to an end and begins a new chapter in positive working relationships with our neighbors and city leaders." The EPA said in a news release on Thursday that environmental sampling at Berkeley Lab found tritium levels well below federal health standards, and is opting for no further action under the Superfund program. The EPA said it analyzed dozens of "split samples" of air, water and soil, which it compared with sample data from the Lab. The results confirmed that the site does not present a health threat to those working and living in and around the facility. The EPA thus changed the site's Superfund status from "potentially eligible" for listing to "no further federal response." With the National Tritium Labeling Facility (NTLF) in the process of closing down, tritium air emissions are expected to decrease substantially during the course of this year. The EPA will continue to regulate air emissions from all sources at the Laboratory - including those from potential residual tritium contamination - under the Clean Air Act. The California Department of Toxic Substances Control will oversee any future hazardous waste remediation needed at the facility. "The good news is that sampling continues to show people living and working in and around the Lab are not being exposed to harmful levels of tritium," said EPA Regional Administrator Wayne Nastri. "We have studied this issue extensively, and will continue to work with the Department of Energy and the state to monitor tritium-related activities at the lab under the Clean Air Act." Air samples at the site have shown tritium levels at least 10 times below the national standard the EPA considers safe, and soil is more than 100 times below the standard. Most groundwater samples were also well below the standard. In 1999, the Agency for Toxic Substances and Disease Registry, a department under the Centers for Disease Control, completed an extensive health consultation with people living and working around the site. Officials documented that rates of cancer, leukemia, and infertility in the area were no higher than the statewide average. The agency concluded that the site was not posing a health threat to people in the area. The EPA began looking into tritium contamination at the Lab in 1997 at the request of the former Congressman Ron Dellums, the city of Berkeley and the Committee to Minimize Toxic Waste, a Berkeley community group. For the past 19 years, the Lab's National Tritium Labeling Facility has tagged compounds with tritium for use in chemical and biochemical reactions. Until last December, when it ceased operations, the facility emitted very small amounts of tritium to the air through a stack. These emissions continue to meet health standards established under the Clean Air Act. Within the next few weeks, randomly selected employees at Berkeley Lab will be invited to a "listening forum," the first step in what Laboratory management hopes will be a comprehensive assessment of the work climate here. This pilot project is part of the Lab's ongoing commitment to making Berkeley Lab the best place to do science and the workplace of choice for all employees, according to Human Resources Department Head Randy Scott. "To achieve these objectives, we will need to have an ongoing dialogue with our employees," Scott said. "How are we doing? What needs improvement? How can we make this a better place to work? This assessment pilot is a way to learn more about how employees feel about working at the Lab and their ideas for ways we can improve the work climate here." Each of the 12 forums, to be convened during the months of July and August, will include a group of 15 to 20 randomly selected employees who will engage in a 90-minute conversation with a meeting facilitator. The results of those discussions will then be shared with management review teams, who will talk about outcomes and possible next steps in "response forums." Additional solicitation of input on workplace environment will continue through the year, according to Scott. Scott said, "We need to hear about what it's like to work here, if we are going to make the Lab the best place to work and to do science." "Berkeley Lab will be the best place in the world to conduct scientific research. We will be part of a unified laboratory, where the full contribution of every individual is expected, respected and recognized," the vision states. "Revolutions in astronomical observation lead to revolutions in understanding," said Hakeem Oluseyi of the Physics Division, in the fourth of the Summer Lectures presented by the Communications Department. 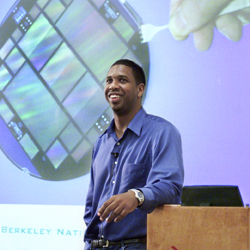 Oluseyi, who has done x-ray and ultraviolet astronomy with sounding rockets and holds patents in computer chip manufacture, was a particularly apt choice to introduce the CCD imager at the heart of the proposed SuperNova/Acceleration Probe, SNAP. He struck a resonant chord with an enthusiastic audience of summer students, fellow astrophysicists, scientists from other fields, and other Lab staff. Many were especially receptive to Oluseyi's historical perspective, which began with a 7,000-year-old Egyptian stone circle, an early effort to understand the calendar and the seasons. The realization that Earth is not the only planet, much less the center of the universe, we owe to the accidental invention of the telescope by children playing with lenses in a Dutch spectacle shop, with subsequent improvements by Galileo, Kepler, and Newton. Herschel built the first telescope designed to look deep rather than just increase magnification, Oluseyi said, but it was only 80 years ago that Hubble proved our Galaxy is not alone in the universe. The Hubble Space Telescope finally brought that home with awesome images of the Hubble Deep Field. "SNAP will look two times deeper into the universe, producing Hubble Deep Fields routinely," said Oluseyi. "As the Hubble Space Telescope was to Galileo's telescope, SNAP will be to Herschel's telescope. SNAP is the next revolution in astronomical observation." The 2002 Summer Lecture Series wrapped up on Wednesday, July 24, with a lecture by Ashok Gadgil of the Environmental Energy Technologies Division, who described current research on "Protecting Building Occupants from Chemical and Biological Agents." Contaminants behave differently indoors than outdoors, Gadgil explained, and the flow of a pollutant through a building can be hard to predict. His group studies how various agents move through a building, and how their paths are affected by changes in the building, such as opening doors or windows or turning the air conditioning on or off. Gadgil showed examples of the experiments and computer simulations of pollutant releases his group uses to address these issues. One of the group's activities is to advise emergency personnel on how to best respond in case of an attack and save lives. Their new website (http://securebuildings.lbl.gov) shows how chemical plumes behave in prototypical buildings under a variety of scenarios. The site receives about 10,000 hits a month. www-library.lbl.gov/teid/tmVideo/aboutus/VideoDefault.htm. Click on the "online presentations" link on the left to start playing. Berkeley Lab is playing host to one of the largest batches of undergraduate interns this summer -- 87 students -- who are congregating here for 10 weeks of hands-on research. "It's our best year ever," said CSEE head Rollie Otto, head of the Center for Science and Engineering Education (CSEE) which is sponsoring the undergraduate programs. "We have an outstanding group of young students here." Visiting teachers from across the country are part of the programs as well. Professor Carlos Rios-Velasquez (left) and his students Elizabeth Padilla and Felix Santiago from the University of Puerto Rico, Mayaguez, work with Terry Hazen of Earth Sciences (back), as part of the Faculty and Student Teams (FaST) program. Berkeley Lab has a long tradition of mentoring students, having hosted summer interns almost since its founding. And this year CSEE is sponsoring some new programs. Five students and three teachers are part of the Faculty and Student Teams (FaST) program, designed in conjunction with the National Science Foundation. FaST reaches out to faculty and students from colleges that do not normally receive significant federal research funding. Teams of professors and students work along with a Lab scientist on research projects. The professors aim to incorporate the techniques developed here into the curriculum at their respective schools. One FaST team is that of Carlos Rios-Velasquez, a microbiology professor from the University of Puerto Rico at Mayaguez, and his students Elizabeth Padilla and Felix Santiago. They are working with Terry Hazen of the Earth Sciences Division. "I love to teach and I love to do research," says Rios-Velasquez, who holds a doctorate from the University of Wisconsin at Madison. "This gives me an opportunity to do both." The team is analyzing the structure of microbial communities in samples from landfill simulations and from Yolo County landfill. 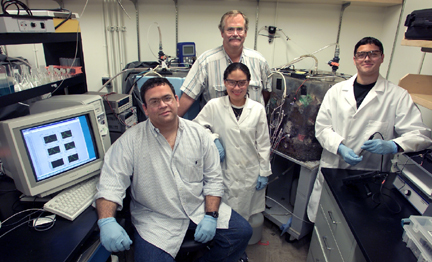 Their work promises a new paradigm for how we handle our garbage by helping researchers learn how to convert landfills into aerobic bioreactors. This will facilitate biode-gradation and thereby reduce the toxicity, smells, greenhouse gases and costs, naturally. Padilla is in her fourth year of study in industrial biotechnology, and Santiago just finished his degree in general biology and will be applying to graduate schools this fall. "I like to experience different fields of microbiology," said Santiago, "because it gives me a more open mind to the whole field. I'm learning new techniques I'll eventually be able to use." The research they do this summer will lay the groundwork for an ongoing collaboration with Hazen, thus providing an opportunity for students and faculty from Puerto Rico to do cutting-edge original research. They may also apply these techniques to local landfills, where space on the island is at a premium. "It's always great to work with students who are young and excited," says Terry Hazen, who taught at the University of Puerto Rico at Rio Piedras for eight years and has mentored literally hundreds of students during his career. The two other FaST teams are from Evergreen Valley College in California and Austin Community College in Texas. Other interns at the Lab this summer are sponsored by the Department of Energy's Energy Research Undergraduate Laboratory Fellowship (ERULF) and Community College Initiative and Pre-Service Teacher programs. Mary Griffin, a senior in chemistry at Vassar College in New York, is working with chemist William Lester. Her work involves writing computer code to enable testing a variety of correlation functions for use in quantum Monte Carlo computations of the electronic structure of molecules. "Mary can make a real contribution to our research, which very unusual in our group," said Lester. "It's been a delight to have her here." Griffin hopes to go on to graduate school in theoretical chemistry, possibly at UC Berkeley. Daniela Leitner of the Engineering Department mentors Gustavo Gonzales, a junior in mechanical engineering at Santa Monica College who is modeling the beamline optics of the 88-Inch Cyclotron this summer. Leitner stresses the importance of research internships for both student and scientist. "The students help the mentor a lot," she said. "The projects he's doing should have been done years ago. I just haven't had time. Gonzalez agrees that the hands-on experience he gains here is an important part of his education. "You don't really get a feel for it in a book," he said. "Most of the time all you'll see is a diagram, but here you can see it and touch it." All of the interns are required to write a short paper and prepare a presentation or educational module on their research. Most also have the option of writing a full technical paper, which may be submitted to the Journal of Undergraduate Research, one of the few opportunities for undergraduate scientists to be published. The results of students' summer's research will be on display during the annual undergraduate research poster session, to be held in the cafeteria on Aug. 13. Lab employees are invited to attend. Pam Reynolds is an intern in the Lab's Communications Department. The University of California has selected Blue Cross of California to provide an array of medical plans to UC employees, retirees, and their eligible family members beginning, Jan. 1, 2003, UC announced on July 18. The University will also continue the HMO plans it currently offers its members. Blue Cross will be the Point-of-Service (POS) plan - a referred provider organization (PPO) plan - as well as the Core and High Option plans. It will replace the current three-tier UC Care plan offered by Aetna U.S. Healthcare. The POS plan is a two-tiered plan providing both in and out of service area coverage levels. A PPO tends to offer a greater range of choices but at a higher cost than do HMOs. The selection of Blue Cross concluded a nine-month competitive bid process. The UC-sponsored HMOs (Health Net, Kaiser, PacifiCare and Western Health Advantage) were not part of the bid process, and contracts for HMOs are currently undergoing annual review. Further details will be made available in time for employees to make informed choices during Open Enrollment in November. In a message sent this week to benefits and HR managers within the UC system, UC Treasurer Barbara Facey reassures employees that their retirement plans are secure in the face of the stock market's latest decline and news about corporate accounting problems. "We want to assure you that the University's Retirement Plan equity remains strong, benefits to retirees will not be affected, and employees' future pension benefits are secure," she said in the statement. "The UC Retirement Plan is a balanced portfolio, with investments in a variety of asset classes designed to reduce risk. Thus, while the major U.S. equity markets declined anywhere from 18 to 32% over the past year, our plan's total portfolio performed much better, thanks in part to a 9.5% gain in its bond portfolio." The Treasurer's message can be read at http://www.ucop.edu/bencom/news/message.html. Delta management and the union negotiating team have renewed talks. Management employees in San Francisco and Rancho Cordova were reassigned to handle claims processing functions. According to Delta, they are keeping pace and the management hopes to reopen phone lines soon. Kenneth Ross MacKenzie, a codiscoverer of element 85, astatine, and a member of the team that helped Ernest Lawrence build the first cyclotron, died on July 3 at his home in Los Angeles from complications following a stroke. He was 90. MacKenzie had taught physics at UCLA for more than four decades beginning in 1947. 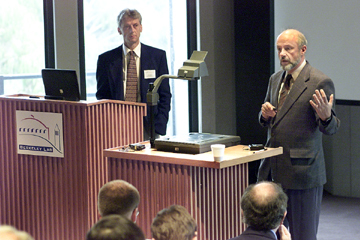 As a doctoral student at UC Berkeley he worked under the mentorship of Berkeley Lab founder E.O. Lawrence. He was part of the three-men team who discovered astatine, the first element to be synthetically manufactured, which helped verify the accuracy of the periodic table. He also helped Lawrence build the original cyclotron, and later used his accelerator-building expertise in many capacities. He directed the construction of a 49-inch cyclotron for UCLA and, along with a colleague, formed a corporation in 1958 to build cyclotrons for use in teaching physics. Later MacKenzie turned to studying plasma gases for use in fusion energy and founded UCLA's Plasma Physics Laboratory. He focused his research and teaching on fusion technology and the study of dark matter. A native of Portland, Oregon, MacKenzie grew up in Victoria, British Columbia, and earned undergraduate degrees from the University of British Columbia. Governor Gray Davis has announced the reinstatement of last year's "20/20" energy rebate program, which allows consumers to knock 20 percent off their utility bills by reducing their energy usage by 20 percent. Last summer Berkeley Lab contributed to the estimated $285 million in customer savings through its own "20% Solution" website (http://savepower.lbl.gov/). The site has been updated to reflect the 2002 program. Antique voltmeters, microscopes and slide rules may have little use in UC's high tech physics department, but their sentimental value may be worth their weight in gold. Excavated from storage by UC Berkeley's department of physics, 15 instruments drew a large crowd recently at Oakland's Harvey Clar auction house and raised $3,200. The sale was but a preview of a larger auction to be held this weekend, July 27-28, which will feature 400 additional voltmeters, galvanometers, balances, microscopes, collision-ball apparatuses, demonstration-size slide rules, and other items. The physics department will use the proceeds to buy new equipment for its undergraduate laboratories. The instruments surfaced back in May as the department prepared to move out of LeConte Hall's older wing for a seismic retrofit and into a temporary home in the Hearst Annex. Call Lisa Cordova at X5521. Announcements for the General Calendar and Bulletin Board page may be sent to [email protected]. Seminar & Lectures items may be mailed to [email protected]. You may also fax items to X6641 or mail them to Bldg. 65B. The deadline for the Aug. 9 issue is Monday, Aug. 5 at 5 p.m.
* Includes EHS 392/405, followed by the orientation. Please promptly for sign-in. To enroll, contact Valarie Espinoza at [email protected] or enroll via the web at https://hris.lbl.gov/self_service/training/. Preregistration is required for all courses except EHS 10. For a full, updated schedule, see http://www-ia1.lbl.gov/schedule/. Registration is in progress for Berkeley Lab's two-day Summer Blood Drive, scheduled for Tuesday and Wednesday, Aug. 6 and 7. While drop-ins are welcome, employees are encouraged to schedule an appointment at the BeADonor website (www.BeADonor.com) to help planners with the event. (Use company/group code "LBL" on the web form.) The registration process is easy and allows you to find a time that best suits you. To be eligible to give blood for transfusion, donors must be healthy, at least 17 years old, weigh at least 110 pounds, and not have donated blood in the last 56 days. More information and eligibility requirements can be found on the website listed above. The onsite blood drive at Berkeley will be held in Building 70A, Room 3377 from 8 a.m. to 2 p.m. All participants will be entered in a prize drawing. For more information contact Charlotte Bochra at X4268. Submissions must include name, affiliation, extension, and home phone number. Ads must be submitted in writing via e-mail ([email protected]), fax (X6641), or delivered/mailed to Bldg. 65B. Ads run one week only unless resubmitted, and are repeated only as space permits. They may not be retracted once submitted for publication. The deadline for the Aug. 9 issue is Thursday, Aug. 1.